I’m a sucker for a psychological thriller so when I saw this pop up on Twitter I knew I had to request it! The premise sounds great. A man waiting to throw himself infront of a train, what led him there? Why is that the only solution? 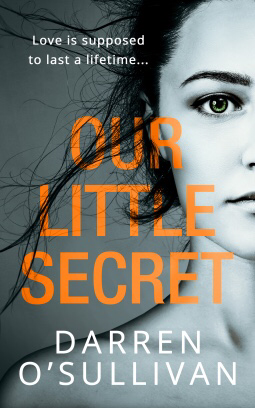 Our Little Secret is the debut novel by Darren O’Sullivan. It begins with a man on a train station platform. This man, Chris, is waiting for a train. Not to get on it, but to jump in front of it, so that he can be reunited with his wife. He doesn’t factor is Sarah, who happens to end up on the platform at the same time. Suddenly, everything he has planned in advance gets thrown in the air as he is unsure what to do. What follows is a very tense psychological thriller. Chris has lost his wife, and he can’t cope without her. Sarah is struggling along in her own life too. When they are thrown together in unusual circumstances, can they find any good in their lives to share with each other? I can’t write this review without mentioning this next bit. Within the first few pages, I had it figured out. I don’t know if that’s because I read so many of these books or there were subtleties that I picked up on which were indicators of what was to come. Whatever it was, I knew where the book was going in the first 5% of reading. BUT the author has a real talent for grabbing the reader and not letting them go until the end! Darren O’Sullivan has a great writing style, and he has created some excellent characters. The vignettes into the characters pasts are totally at odds with the current situation, which I loved, as it shows a completely different side to them. Our Little Secret is definitely gripping. Packed with drama and with a super cast of characters, O’Sullivan is definitely one to watch in the future! If you enjoy psychological thrillers, then this should definitely be on your list! Lovely review of this book.